One of Three Great Routes. Dinner party to organise for 8pm, work to finish at 5.15pm, an hour's commute and shopping to consider - would I be cutting it fine if I did my 5 mile tempo straight after work? Well, that's what I did, and finely I did cut it! 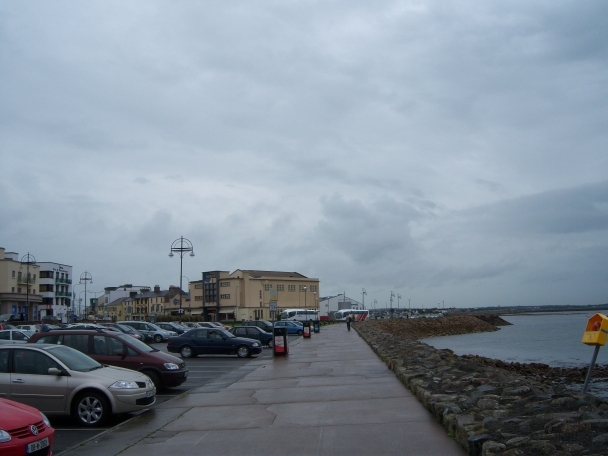 My route was the Salthill prom - out to Mutton Island, around South Park and back down towards the prom, and my training schedule called for a 'mid-tempo' pace. I'm not quite sure what a mid tempo pace means, but I took it to be 'quick enough', so I ran at a level above the norm. There were times during this run when I thought I was going to konk out, but I kept going and discovered a second, third and even a fourth 'wind'. I'm blessed with great training routes: Seanadh Phéistín, An Cheathrú Rua, and Salthill... each has it's own merit, but the one factor in common to all is wonderful scenery. The Salthill route is probably the easiest of the three in terms of being flat as a pancake, but this allows me to concentrate on building a little speed. The 'prom' is an old walkway that hugs Galway Bay and is used by thousands of walkers every day - so the scenery, both human and natural, is always interesting. I even managed to finish this particular run with a spring in the aul step. And believe me, I needed the spring in the step to prepare for a dinner party with very little time to spare! By the time I got home my wife and I went straight to peeling spuds, carrots, parsnips - sticking them all in the oven with some chicken, rushed a shower, got dressed, quick kitchen clean and hey presto, guests arrive (never knowing the panic of the preceeding 30mins!). Full of Beans After Last Night's Repeats. I sprung out of bed this morning at 6am . Surprisingly I was full of energy, something I didn't expect following yesterday evening's interval training session. What was required of me was 6 by 800m repeats at 3/4 pace, with the obligatory warm up and down. This was my first session of interval training since early August, so I didn't know how I'd react. After the second 800m set I nearly collapsed, put my hands on my knees, gasped for air as my chest contracted, and thought I would drop dead there and then on the football pitches of South Park! And what a place to cork it - with the sun shining on Galway Bay, boys playing hurling, women out walking and jogging and life whizzing all around me... and there, in the middle of it all, am I - having a collapse! I recovered enough to run the third set of 800s at a slightly (ok, significantly) slower pace. And then the fourth set, fifth set and finally sixth set of 800s - hey presto, job done! A hell of a tough workout. And the effect of it all: I sprung out of bed at 6am this morning, went for a walk, cleaned the kitchend and am full of beans and ready for work! 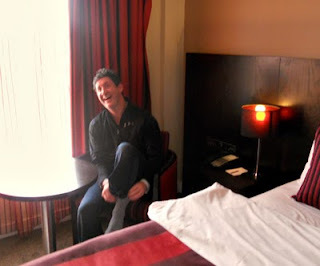 We cheekily asked the local hotel if they would allow us the use of a room for a quick shower following our run and they duly obliged for a very small fee... young Kevin looks satisfied. 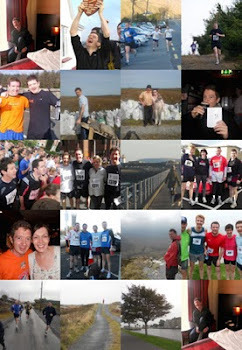 September's 'Run a Month' effort brought us to the lovely town of Loughrea to participate in a very popular 10k. Cormac is currently injured but both he and his good wife, Ruth, were at hand to mind Kevin's young ones while the Keester and I set about the Grey Lake run. To make a real family occasion of it my mother and father came along. This is a fine race, very well organised and an obvious favourite with running clubs up and down the west. As Kevin and I trotted down towards the starting point I took a bad fall on the wet sidewalk. My legs went from under me on a slippy surface that had some kind of liquid (coke perhaps) spilt on it. I was lucky not to have been hurt and, thank God, I was back on my feet and heading towards the start line in a matter of seconds... Following some terrible morning showers, the day cleared up very nicely. The first few hundred metres were very congested and it was hard to find a clear running path, such was the interest in this race, but when things settled down Kevin and I fell into a nice, steady pace - around 8.30mins/mile. It wasn't an easy 10k (most of the first half was uphill), but it was extremely enjoyable. We chatted our way around the course and I could definitely see a big improvement in Kevin's fitness since the Breaffy 10k a month ago. Our aim was to bring it home inside 53mins, and the clock at the end read 52.44, so job done! It was comfortable and highly enjoyable. Next up is the Conamara 10k, organised by my own club Tríspórt - then it's off to the Phoenix Park for a 12k in November, followed by the grand finale of our 'Run-a-Month', the Waterford half marathon in December. Santy should be very good to us this Christmas. It wasn't a long cycle, but it was great to be back on the bike this evening for the first time since my epic Conamara-Louth trek earlier this summer. All I had to spare was about 40 minutes so I hared up the road, over to Dóilín strand and around the peninsula... I was finished in 35minutes with only around 7.5 miles done, but it genuinely felt great to be ploughing through the air at the pace of a racing bike. It also brought me back to those heady days of August when I roamed free and easy through the Irish countryside on my own little odyssey. There's a spring in my autumn step at last! My work roster gave me a free day today and I used it productively, thank God! Apart from tidying the house a bit the number one thing on my agenda was to get out and run... These past few weeks have been very stop start and I've been in dire need of a mid range run to boost confidence and get back on course for my half marathon training. So I decided to do the Dóilín route - a handy local run that amounts to 7.5 miles. Today's weather was absolutely beautiful (if you're a runner), and absolutely miserable (if not). Yes, drizzle, and lots of it... The trick with drizzle is that you have to get out and get warmed up asap, preferably during a dry patch. Once warmed up the constancy of drizzle is akin to being in a jacuzzi - lovely and refreshing, and very, very wet! My pace today wasn't too fast but I felt good throughout and this will do wonders for my resolve to eat well and train well for the next few weeks and months. A word on the weekend's sporting action: great win for Ireland against Australia in the Ruby World Cup - I think they can make semis now, and good to see Dublin win an All Ireland footbal final at last (but I hope it doesn't become a habitual thing!). And after the storm... all calm on the western front! A beautiful evening in Galway, hurricane Katia is well gone and the city of the tribes returns to it's usually happy self. And I took full advantage by stopping off in Salthill after work for a nice six mile trot. I ran the prom - that most famous of seashore walkways - and then headed out to Mutton Island Lighthouse, before circling South Park and heading back towards the prom again. I'm not zipping by any means, but at least the upward curve continues! The mackerel fishers were back in force - one old man carried a pastic bucket in one hand and a fishing rod in another as he made his way to a prime spot by the shore. A little boy stood five paces behind his father who pointed a strange looking, half-size rod at the horizon. 'You'll catch nothing with that thing', I thought to myself, and just then his line strained and he began to reel like mad... Never underestimate the power of the Salthill prom! I thought I was a brave and hardy soul venturing out into the tail end of hurricane Katia for a five mile run yesterday morning, until I was firmly put in my place by Big Ron. Startled by a passing car going 'beep beep' as I passed through the village - I hopped on to the path, and viewed Big Ron as he whizzed by with an upward thumb extending through the car's front window and a racing bike on the back rack. Last week's ironman was on his way to compete, and ultimately finish in the top 15 of the Loughrea Triathlon! I could barely fight the winds on a short route, not mind struggle with rough water and a light bike! Congrats to the big man, but I really am babystepping my way back to form. On Friday I jogged three miles on the Salthill prom, so a five miler shows some improvement. Whatever summer cold I picked up after my big cycle is taking ages to evacuate the system (man flu my wife would say). I need to start looking for a September run for the 'Run-a-month' club... onwards, brave soldier! 3 Miles Up and Down the Blustery Road. Winter is coming early this year by the looks of things. We've already begun putting down fires and it's starting to darken a good deal earlier. The rain lashes and the wind howls - they love each other really though.... I stepped out into the wild this evening for a short 3 mile run up an down the road. The past few weeks have been slightly slow for me on the running front, so I took this evening nice and slow. There won't be a Dublin Marathon for me this year, unfortunately, but the big aim is to finish the 'run a month' adventure with a half marathon in the beautiful city of Waterford... breaking my half record and enjoying some pre-Christmas bevvies - now wouldn't that be nice! 4 Miles at a Stretch. I don't know what's in the water these past few weeks but following a bit of a tummy bug last week I still haven't been 100%. I thought my Breaffy 10k on Sunday last would put an end to the lethargy but once again, this week, I was more inclined to rest than run. However, a man has to push on at some time... so I drove to Seanféistín today for a 4/5 or 6 miler - depending on form. Well inside the first mile I had resigned myself to completing the shorter distance. My legs were almost wobbly weak! The first two miles of the Seanféistín stretch is basically a slow incline, so it didn't help much! However, I stuck with the task and completed the distance - this run should help me along my road to full running... HOPEFULLY!